Temporary escape routes for congested cities. London is famous, among other things, for its many green spaces, which are a welcome escape from the busy metropolis. However, as with all other urban elements, they are planned and controlled to a greater or lesser degree. The task was to create more such places, these urban escapes inside the city. 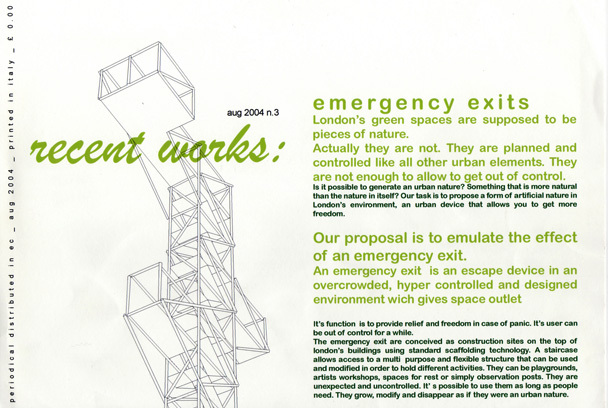 The proposal was to expand on the concept of the Emergency Exit and to construct small areas in the middle of the city where Londoners could ‘escape’ from the surrounding chaos. Placed on the top of buildings using standard scaffolding technology, a staircase allows access to a multipurpose and highly flexible structure that can be configured to host different pursuits (playgrounds, places to relax and unwind, observation spots).